This parking ramp is located directly across the street from Saint Paul RiverCentre and is connected via skyway system. There are a myriad of parking ramps and lots in the downtown area. Click on this link for an interactive parking map of downtown Saint Paul. Saint Paul RiverCentre is easy to access from several Metro Transit bus lines servicing the downtown Saint Paul area. 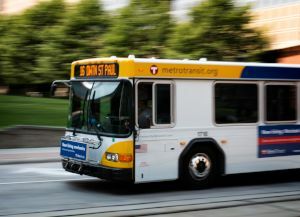 Metro Transit offers an online Trip Planner that allows travelers to create a custom personal schedule to travel by bus to Saint Paul. To do so, enter your starting address and select RiverCentre as your landmark. Saint Paul RiverCentre is located six blocks from the Metro Transit light rail stop servicing the downtown Saint Paul area. 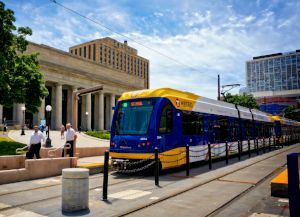 Metro Transit offers an online Trip Planner that allows travelers to create a custom personal schedule to travel by light rail to Saint Paul. To do so, enter your starting address and select RiverCentre as your landmark. 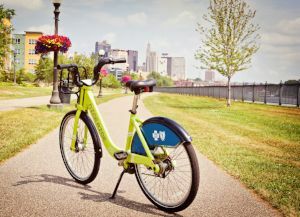 As part of Saint Paul RiverCentre’s commitment to being a leader in sustainability, we are proud to offer a multitude of bike parking for riders at a variety of locations around our facility. Our bike racks are made of recycled content and are yet another step in our goal to reduce our carbon footprint and create a setting that encourages sustainable choices. Five bike racks can be found on our campus.